Beni's Falafel in Makati is not that hard to find. It's just right beside A.Venue along Valdez Street, though they will be moving to A.Venue soon. 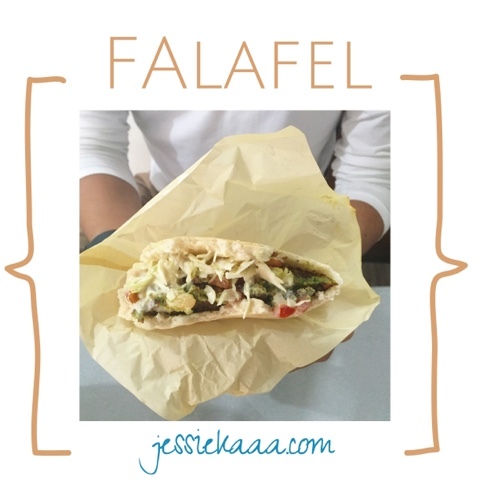 Beni's Falafel is a quick healthy fix. A Falafel is made from chickpeas so It can be considered as a vegan food. Their hot sauce compliments well with the Falafel, but be careful with putting a lot of it, though. And let's don't forget it's Tahini Sauce (made from sesame seeds). There's not much customers when we came here on a weekday afternoon. Most come by just to take out. I will be coming back for their other bestseller, the Shakshuka. They also have appetizers and rice meals. *I will recommend for you not to get the half, coz it's really small. And beside, it's vegan, why not go for the bigger one! So I live in the Middle East (where falafel originates) but I still haven't tried a single falafel my whole life. How lame am I?